The 2017 FCS Championship will be determined on January 7, 2017 between Youngstown State and James Madison. Note: This is the National Championship preview following the 2016 FCS Season. 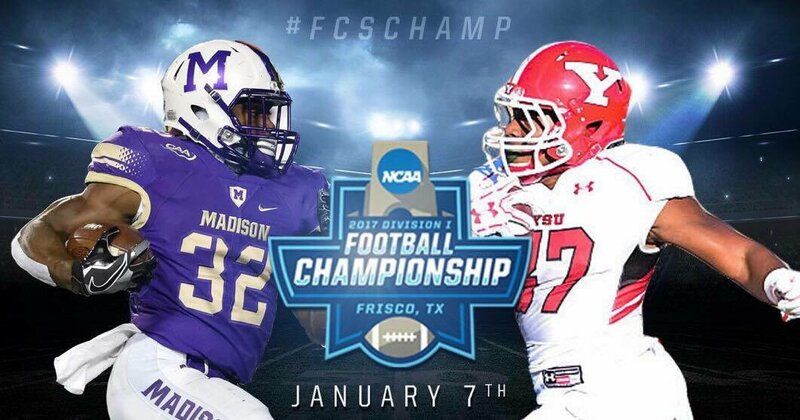 The FCS season has just one game left and it is the National Championship between the Youngstown State Penguins (12-3) and James Madison Dukes (13-1). Both teams have had tough roads to get here and are deserving of their spot in the National Championship. The FCS National Championship will be played on Saturday, January 7 at Toyota Stadium from Frisco, Texas. The game will be shown on ESPN2 with a kickoff time of 12 PM Eastern. Through four rounds, our predictions have gone 19-3. Below are the links to our predictions for the previous rounds along with the record for that round. Below is the 2017 FCS National Championship game preview and we will also provide a prediction for this matchup. The Penguins opened the playoffs with a comfortable 38-24 win over Samford and then had a great game plan against Jacksonville State (force Eli Jenkins to throw) and won 40-24 to reach the Quarterfinals. They won a hard-fought game at home versus Wofford 30-23 in double overtime and then played a wild contest out west at Eastern Washington. Kevin Rader’s catch against the defender’s back gave YSU the 40-38 win and the berth in the title game. The Penguins average 28.5 points (37 in the playoffs), 431.6 yards, 257.5 yards rushing, and 174.1 yards passing per game on offense. Quarterback Hunter Wells has gone 7-1 since taking over the starting spot from Ricky Davis. Wells has thrown for 1,453 yards (63.5%) with 9 touchdowns and 4 interceptions. Wells will be boosted by a strong backfield combination of Jody Webb (1,301 yards, 6 touchdowns, and 6.1 yards per carry) and Tevin McCaster (616 yards with 11 touchdowns and 4.9 YPC). Webb has six straight 100 yard rushing performance and is averaging 157 yards per game in the playoffs. McCaster had a breakout game against Eastern Washington with 154 yards and 3 rushing touchdowns on 29 carries. This duo will be leaned on to get the offense going. It is worth noting that the team’s second leading rusher, Martin Ruiz, will not play in this game. He had 1,153 yards and 12 touchdowns this season, but was arrested on a weapon charge. The receivers are not overwhelming with Alvin Bailey the leader in both receptions (40) and touchdowns (5). Bailey is third on the team in yards at 443. Darien Townsend has 32 catches for 525 yards and 4 touchdowns while Webb has caught 26 passes for 328 yards and no touchdowns. Damoun Patterson is worth keeping an eye on because he is the big play guy. He has only 18 catches, but has 461 yards (25.6 yards per catch) and 2 touchdowns. If the running game struggles, this group will have to step up. The Youngstown State defense allows 19.4 points, 324.4 total yards, 128.1 yards rushing, and 196.3 yards passing per game. The points allowed per game in the playoffs are at 27.3, which is a concern, but they have come up with big stops when needed. Defensive ends Derek Rivers and Avery Moss have been a menacing duo all season. Rivers had 13 sacks and 17.5 tackles for loss on the year while Moss has recorded 9.5 sacks and 14.5 tackles for loss. Linebacker Armand Dellovade has 11.5 tackles for loss and leads the team in total tackles at 98. These three as well as the other players in the front seven will have their hands full with James Madison’s rushing attack. The Penguins have intercepted only 12 passes all season, but LeRoy Alexander has accounted for a third of those. Kenny Bishop leads the team with 11 pass breakups. The kicking duties fall to Zak Kennedy and he has not been great this season. He has converted only 13 of 19 field goal attempts with a long of 46 yards. He has also made 37 of 38 extra points. Mark Schuler has done very well punting the ball with an average of 42.4 yards with 26 landing inside the opponent’s 20. Jody Webb leads the team in kick returns averaging 23.9 yards per return, but has not recorded a touchdown. Darien Townsend has a 19.4 yards per average return on kickoffs, but can be dangerous on punts. He has averaged 11.9 yards per return on punts and returned one for a touchdown. James Madison opened the playoffs with a bye before back-to-back blowouts. They decimated New Hampshire 55-22 with quarterback Bryan Schor throwing for 371 yards and 5 touchdowns. In the Quarterfinal versus Sam Houston State, the Dukes obliterated the Bearkats 65-7 with 144 yards and 2 touchdowns on the ground from Trai Sharp and 141 yards and 3 touchdowns rushing from Khalid Abdullah. The defense held the prolific passing of Jeremiah Briscoe to just 143 yards on 13 of 44 passing with no touchdowns and 2 interceptions. The Semifinal was on the road against the 5 time defending National Champions North Dakota State. Abdullah ran for 180 yards on 23 carries while Schor threw for 242 yards with 3 touchdowns and an interception. The defense held the Bison to 132 yards rushing and a 3.4 yards per carry average. The offense for James Madison averages 48 points, 525.6 yards of offense, 284.6 yards rushing, and 241.1 yards passing per game. Bryan Schor leads the team as the quarterback and has thrown for 2,890 yards with 27 touchdowns and 6 interceptions. More impressively, he has completed 73.7% of his passes. Schor is complimented in the backfield by Khalid Abdullah, who has rushed for 1,708 yards with 20 touchdowns and averages 6.3 yards per carry. Schor is third on the team in rushing with 543 yards and has 10 rushing touchdowns so he can also get the offense moving with his legs. Trai Sharp had big games versus New Hampshire and Sam Houston State, but was held to just 14 yards on 4 carries against North Dakota State. He has the potential for big runs if he can get some touches in the Championship game. The receiving group is pretty balanced with many contributors. Brandon Ravenel leads the team with 45 catches for 720 yards and 5 touchdowns. Domo Taylor has 34 catches for 547 yards and 3 touchdowns and Rashard Davis has 39 catches for 478 yards and 2 touchdowns. Terrence Alls has 39 catches for 575 yards and 5 touchdowns on the season, but he will miss the National Championship along with 6 other players. The defense allows 21.7 points, 348 yards of offense, 137.8 yards rushing, and 210.2 yards passing per game. They have been dominant and physical the entire postseason (see both Sam Houston State and North Dakota State games for some great examples). Star linebacker Brandon Hereford had 96 tackles and 7.5 tackles for loss, but will miss the game along with Alls and five others. Simeyon Robinson and Martez Stone will anchor the defensive line with Robinson recording 4 sacks and 7.5 tackles for loss this year. Stone also has 4 sacks and 7 tackles for loss and both will be key to stopping the run and getting pressure on the quarterback. Gage Steele will be the main linebacker and he has 98 tackles on the season with 4.5 tackles for loss. Leading the secondary is Raven Greene, who has a team high 6 interceptions and also is tied for second on the team with 7 pass breakups. Taylor Reynolds leads the team in pass breakups with 12 and also has 2 interceptions. Tyler Gray will handle the field goal duties, but he is just 14 of 21 on the season with a long of 45. Gunnar Kane will be the punter and he averages 42.2 yards per punt and has landed 20 inside the opponent’s 20. The Dukes have two dangerous kickoff returners between Robbie Walker (21.5 yard average) and Brandon Ravenel (23.9 yard average and a touchdown). The real difference could be on punt returns where top returner Rashard Davis has averaged 29.9 yards per return and taken four (!) back to the house for a touchdown. Youngstown State is making their first appearance in the FCS National Championship since 1999 and they have won four titles in school history (1991, 1993, 1994, and 1997). Those four titles came with Jim Tressel as the head coach and Tressel is now the President of Youngstown State. As for James Madison they have only been to one National Championship and that was in 2004 when they defeated Montana 31-21. Both teams are coming into this contest facing a slew of suspensions. They have been known for a few weeks so there should not be much surprise on either side in that regard. Both teams like to the run the ball and prefer to get their offense started that way. However, James Madison can rely on Bryan Schor’s arm if needed. Hunter Wells has played admirably since taking over the starter and has shown the ability to get the job done throwing as well. We like the more physical team to win this game and we are going with James Madison. We are taking the Dukes to win 35-21 to claim their second FCS National Championship.